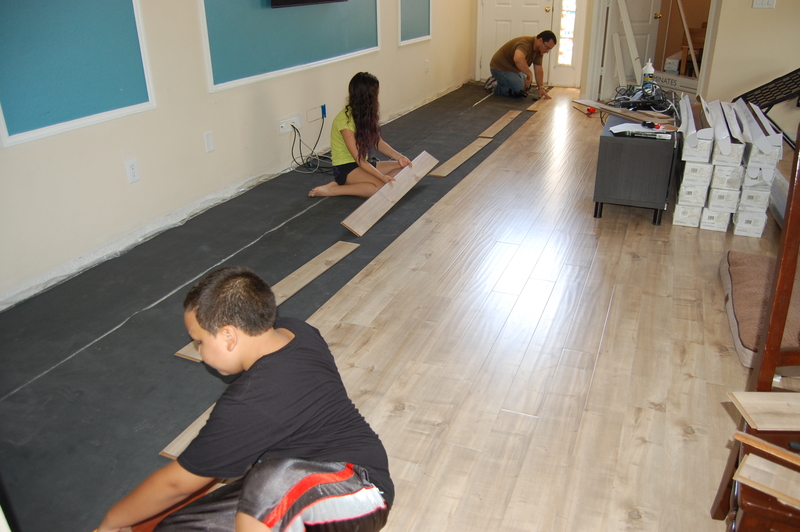 After 5 weeks more or less, we are celebrating our brand new floors in our home. What a sense of accomplishment, relief and freshness! Oh it has been quite a journey and a huge change in our home life. 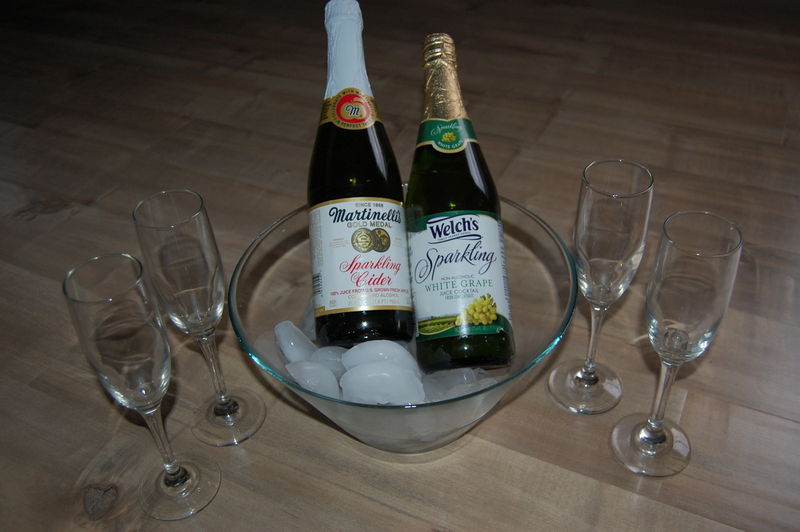 With some sparkling grape juice and apple cider we toasted for a job well done and a home with a fresh new look. We are all enjoying it. So, finally we were on the original concrete floor of our home. I thought I would be more anxious to complete the work quicker, but surprisingly I had plenty of patience and not as bothered by the concrete as I thought. God is good; he knows what we need and when we need it. 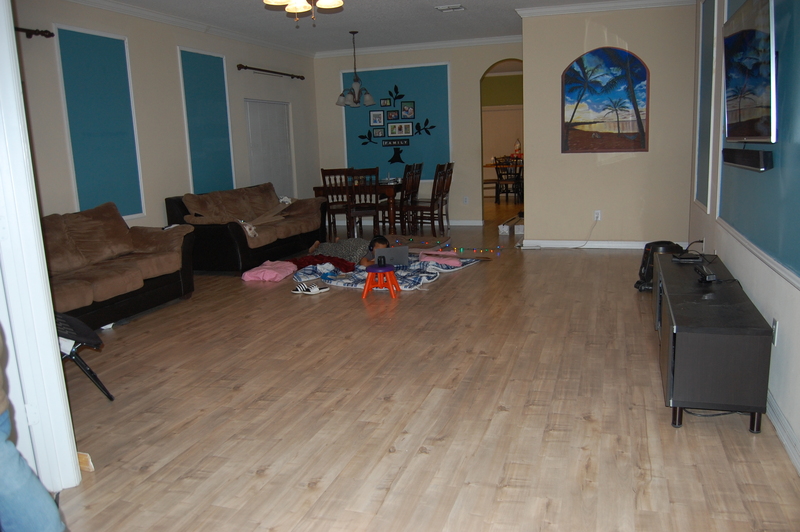 We continued our search for the color of wood for our floors, I preferred a lighter color. We wanted to stay within our budget, so we scouted for prices, and debated between having it professionally installed or a DIY. We contacted a wonderful contractor, which is also a friend of ours; he quoted us a great price for installation and provided pricing and exquisite samples for us to choose from. After comparing samples and getting prices we made our selection but we still entertained the idea of installing it as a family. We decided to make it a family project. We found the color we loved, and as soon as it arrived we started the installation. A family affair, it was exciting and overwhelming at the same time. With the hardworking, handyman I have as a husband, we all started working. Lesson #1 – I have a new renowned respect for the jobs of Contractors, Builders, Architects, Engineers, and Interior Designers. Hats off to them for the marvelous work they do. I am so proud of the work and legacy my uncle and grandfather left in construction. Lesson #2 – I have used muscles I didn’t even know I had. Every inch of my body has hurt, but worth it… “no pain, no gain”. Lesson #3 – Children and teens can really work and enjoy doing it. My kids really enjoyed this project and my son learned to use many different tools. He is a very hard worker like his dad. Lesson #4 – I can adjust to an environment as needed. 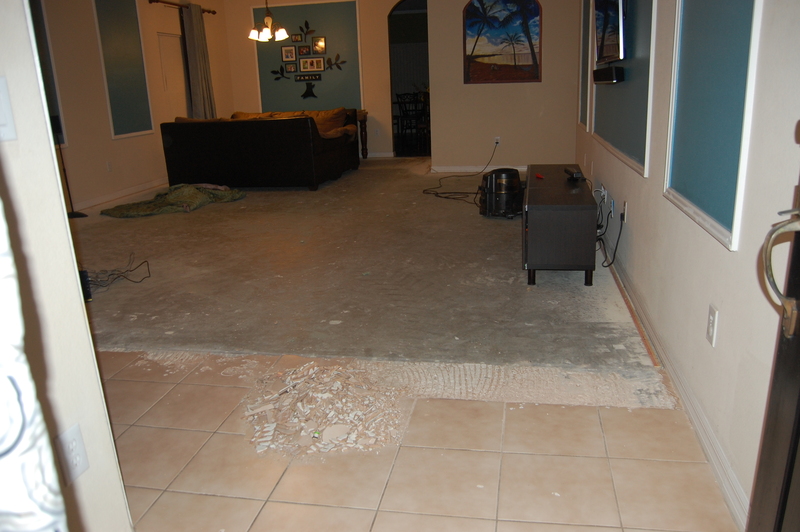 I was able to live with a concrete floor, mess, and dust. God gave me patience and being a special project of ours made it very dear to my heart. Although there were allergies and infections, everyone is now enjoying the smooth floors. Lesson #5 – Cleaning is one of the best activities. It helps us stay active and gives that fresh, new, homey, and healthy feeling. Essential oils have been my friend through this process. Lesson #6 – Team work equals family. You can depend on your family in the small projects and the big ones too. Lesson #7 – Dogs have patience with their owners. My loving miniature schnauzer Snickers has been very patient with us as we move around furniture, make noise, and alter the environment he is so used to. Lesson #8 -Pets need to adjust to their new environment. 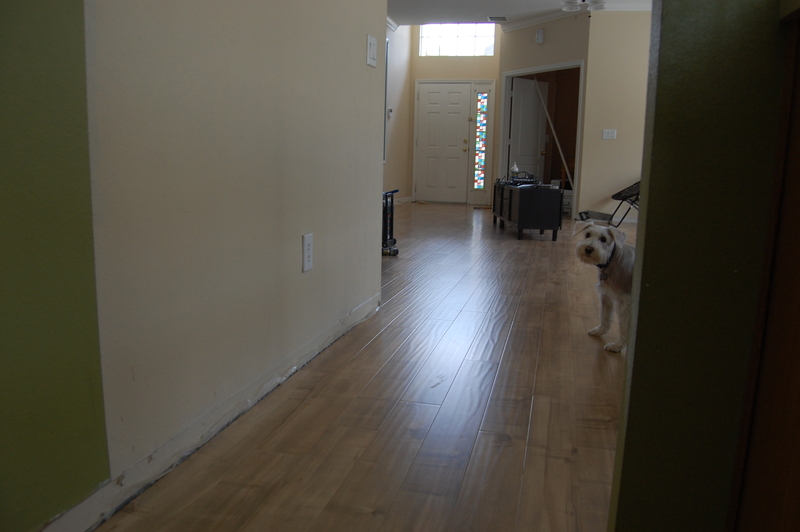 Snickers was fine with the concrete floor but not so much with the laminate wood floor. The floor is very slippery and he can no longer run, and even scared to walk. We are re-training him to walk on the floors ( with a towel path around the house). Lesson #9 – Project completions and changes in life are celebrated. Every day is a day to celebrate, and every little or BIG project can be celebrated. 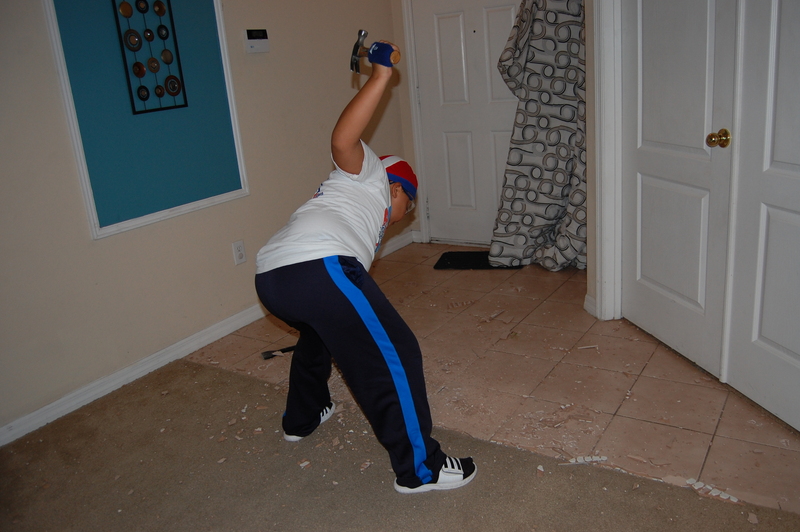 Be installing floors or moving to a new home or neighborhood, celebrate. We had an indoor homemade pizza picnic courtesy of Melody and Ryan and a toast. We did it!!!! Lesson #10 – Don’t be afraid. Do not let big projects or overwhelming tasks keep you from starting. Place it in God’s hands, and start your research and work. Make Google and You Tube your best friends! Refer back and apply as you wish these 10 lessons learned to all areas of your life. My family loves the floor. Hope you liked them and stay tuned for final decoration pictures… Still working on my new fall decor.